Excel Auto offers quality pre-owned vehicles at affordable prices. All our vehicles are inspected by an ASE Master Certified Technician to provide our customers with confidence when purchasing one of our vehicles. We have been helping people purchase vehicles and providing quality service repairs in the Toledo area since 2001. Our friendly associates are always ready to help, and will do their best to provide fast and professional answers to any questions or concerns that you may have. 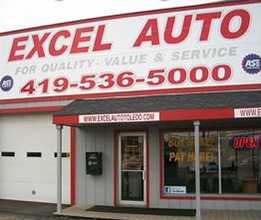 We will always do our best to make sure that your experience at Excel Auto will be a pleasant one! We can help with all your automotive needs!